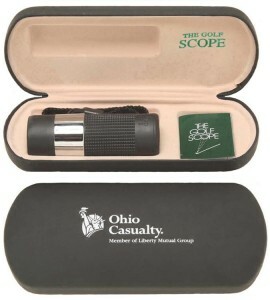 Monocular Golf Scope. Accurately read the distance to the flag stick 6 through this monocular golf scope. Insulated construction keeps the scope safe out of the box, While a padded carrying case keeps it secure when you’re not using it. Comes with an instruction booklet and lens cleaning cloth. Magnifies 8 x 21mm……………(range finder, distance scope, distance finder, golf, golf accessories, golf accessory, golf products, monocular.). #AGX14 25 14.48 ea, 50 13.78 ea, 100 13.27 ea. 250 13.07 ea, 500 12.98 1000+ 11.90. Set up is 56.25. Imprint 4″ x 1″ on the case or 1/2″ x 1/2″ on the scope.